We begin the new year with a new Featured FJV whose commitment to the four core values of JVC Northwest, especially ecological justice, remains as strong as ever. Liz Purdy (Sitka, AK ’10-11, Staff ’11-13) details her time in Alaska as a JV and the environmental protection work that has brought her back. When I first spoke with the Alaska Program Coordinator upon beginning my JV application she told me, “Everything in Alaska is more extreme than [in] the lower 48.” As a native of Seattle, I believed I had a sense of the northern scene I would find as a JV in the rural town of Sitka; and I was excited by the prospect of serving at a domestic violence shelter and the array of challenges that would unfold there. 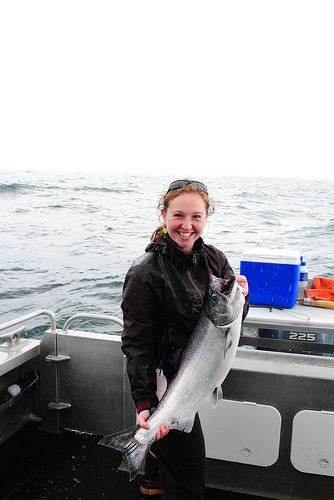 Liz catches her first ever king salmon during her JV year. It turns out my program coordinator was correct; Alaska offered me a life of new extremes. During my JV year I got to know the extremes of the social justice issues within the state and became intimately familiar with the statistics that showed Alaska as the nation’s leader in domestic violence and sexual assault. The people behind these statistics (which are casually read in news briefings throughout the country) are the very individuals served by JVs and former JVs. Besides the social extremes within the state, there are also ecological justice issues rooted in the resource-rich, pro-industry setting of Alaska. A few years after my JV experience, when considering where to pursue my internship for my graduate degree in Sustainable Development, Alaska was high on my list. I was excited to return in a new capacity this past fall working on a policy advocacy campaign focused on the transboundary watersheds between Northwest British Columbia and Southeast Alaska (BC/AK). With JVC Northwest’s value of social and ecological justice deeply in mind, the opportunity to intern with the Salmon Beyond Borders campaign felt like the perfect way to wed my graduate studies with my familiarity and appreciation of the region I served in as a JV. After commercial fishing this summer in Bristol Bay, Alaska, I now reside in Juneau where I work alongside other dedicated individuals to seek protection of the abundant resources of the BC/AK international watersheds. 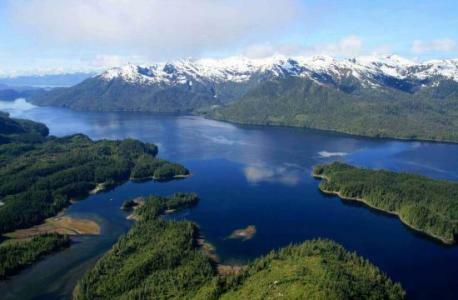 With rapid industrial development of large-scale mining being permitted in BC, the salmon (and all other creatures) that rely on the clean water of Southeast Alaska are at risk. The dam breach at the Mt. Polley mine in BC in August of this year released millions of cubic tons of toxic waste into the Fraser River watershed escalating the concerns of this rapid mine permitting in BC. The concerns about the potential impacts of this development to the Southeast Alaskan way of life are significant and directly connect to the ways I began exploring ecological justice during my JV year in Sitka. As any JV or FJV who has served in (or even just traveled to) Alaska knows, salmon (and the fishing and tourism economies that they support) are the lifeblood of many communities throughout the state. I was privileged to first be able to arrive in Alaska as a JV, and I am grateful to have the opportunity to continue to serve within the region during this campaign for ecological justice. To learn more about and take action on this important transboundary watershed issue, please visit salmonbeyondborders.org.